After a long, cold and very snowy winter it's wonderful to see something green and growing again. It's June 8th and we still have traces of snow in places along the river and logging roads. The season seems to be about two weeks later than normal, all our rivers are in a mid May flow but clearing up very well. The most popular question around camp this time of year is "are the salmon in yet?" or "have there been any fish caught?" I'm pleased to report that the answer is Yes! This past week was our annual Spey Casting clinic at Salmon Lodge. Again this year it was hosted by non other than Topher Browne. 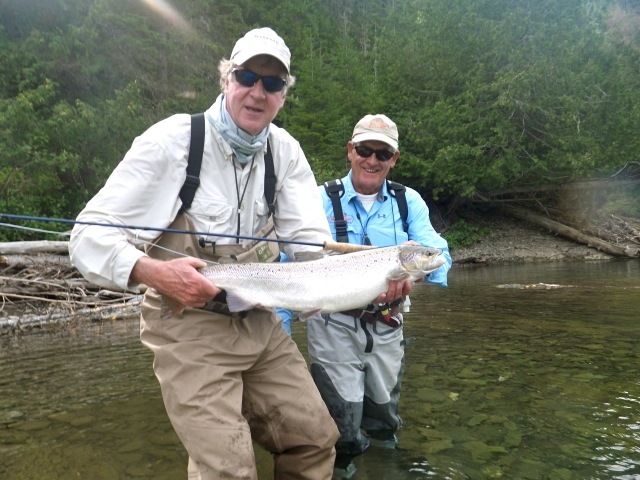 Our guests had the opportunity to improve their casting skills an learn about all aspects of Atlantic salmon fishing. The author of the book "Atlantic Salmon Magic" Topher is an expert on salmon behavior and most of all knowing how to catch them. With most of the weeks concentration on casting our guests really didn't do a lot of serious fishing. One exception was Ottawa native Jamie Johnson. Jamie prefers his single hand rod and fishing from a canoe. On his first pass through Dunbar pool on the Bonaventure his line tightened up to the first bright salmon of the season. Unfortunately after a brief battle the first fish of the season swam free. I'm sure we'll be seeing more and more fresh fish as the days go by. Next week brings the full moon and the high tides of June, this should give us a good boost. This time of the season calls for bigger flys including streamers like the Magog Smelt, Jones Special and the Out to Lunch. Doubles from sizes 2/0 to 4 are the best for high and stained water. Not time for dry fly's yet. That's it or this week and "bottoms up' for a great season!